I have never claimed to be an expert on Romania. Indeed my knowledge of the country is scant since the days when part of it was known as Felix Dacia apart from the memoirs of Geoffrey Household and the historical spy stories of Alan Furst. But I am rapidly being educated thanks to the work of my old chum Mike Phillips who is opening up new frontiers of crime-writing, both fiction and ‘true crime’. Together with Romanian historian and political scientist Stejarel Olaru, who is a respected authority on Romanian intelligence and security services, Mike has written Rîmaru, Butcher of Bucharest, a detailed reconstruction of the sensational crimes of Ion Rîmaru (murder and multiple rapes with allegations of cannibalism and vampirism), who terrorised Bucharest in 1971 before being caught, tried and executed by a seemingly disorganised but eventually efficient firingsquad. 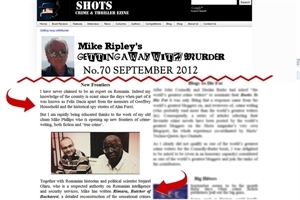 Mike, or Dr Mike Phillips OBE, FRSL, FRSA as I should properly call him, is also championing Romanian crime fiction with the Profusion Crime imprint launched last year (as reported here in December 2011), and has written intelligentIntroductions to their first three fiction titles: Anatomical Clues, Attack in the Library and Kill the General. Should any reader be concerned that Romania might be an unknown foreign country for crime fiction, they should not be afraid as the very clever thing about the Profusion series is that the novels come with explanatory footnotes on the more idiosyncratic or unusual (for we insular Brits) aspects of Romanian life and society. I found these almost as fascinating as the novels themselves and learned a lot from them, not the least being that Palinka is the local plum brandy (usually home-made and I suspect to be treated with caution), that a ‘French-key’ is the Romanian expression for a monkey wrench, that Sarmale – stuffed vine-leaves or cabbage – is the national dish and that Ardeal is the Romanian version of the Hungarian word for Transylvania. There are also many more important, and poignant, references to the “times of sad remembrance” which describe the hardships of life under a communist dictatorship. I know that some readers are immediately turned off by footnotes in works of fiction, but here they are vital and educational, so anyone with any objections should get over them. It is exactly 20 years ago that Mike Phillips and I, along with fellow writers Michael Dibdin and Philip Kerr, took part in an exercise at which I am fairly confident the word ‘Romania’ was not mentioned, when we were all recruited as fashion models to show off the latest styles of trench-coats and fedoras, which were seen by GQ magazine as the de rigeur apparel for the aspiring young crime novelist. I have not seen Mike for some time, and sadly Michael Dibdin is no longer with us, but I think I can confidently say it was the first and last appearance on a fashion catwalk for all of us.